This article is about the historical term Saracen. For other uses, see Saracen (disambiguation). By the 12th century, "Saracen" had become synonymous with "Muslim" in Medieval Latin literature. Such expansion in the meaning of the term had begun centuries earlier among the Byzantine Greeks, as evidenced in documents from the 8th century. In the Western languages before the 16th century, "Saracen" was commonly used to refer to Muslim Arabs, and the words "Muslim" and "Islam" were generally not used (with a few isolated exceptions). The term became gradually obsolete following the Age of Discovery. The Latin term Saraceni is of unknown original meaning. There are claims of it being derived from the Semitic triliteral root srq "to steal, rob, plunder", and perhaps more specifically from the noun sāriq (Arabic: سارق‎), pl. sariqīn (سارقين), which means "thief, marauder, plunderer". Other possible Semitic roots are šrq "east" and šrkt "tribe, confederation". In his Levantine Diary, covering the years 1699-1740, the Damascene writer ibn Kanan (Arabic: محمد بن كَنّان الصالحي‎) used the term sarkan to mean "travel on a military mission" from the Near East to parts of Southern Europe which were under Ottoman Empire rule, particularly Cyprus and Rhodes. Ptolemy's 2nd-century work, Geography, describes Sarakēnḗ (Ancient Greek: Σαρακηνή) as a region in the northern Sinai Peninsula. Ptolemy also mentions a people called the Sarakēnoí (Ancient Greek: οἱ Σαρακηνοί) living in the northwestern Arabian Peninsula (near neighbor to the Sinai). Eusebius in his Ecclesiastical history narrates an account wherein Pope Dionysius of Alexandria mentions Saracens in a letter while describing the persecution of Christians by the Roman emperor Decius: "Many were, in the Arabian mountain, enslaved by the barbarous 'sarkenoi'." The Augustan History also refers to an attack by "Saraceni" on Pescennius Niger's army in Egypt in 193, but provides little information as to identifying them. The Saracens are described as forming the "equites" (heavy cavalry) from Phoenicia and Thamud. In one document the defeated enemies of Diocletian's campaign in the Syrian Desert are described as Saracens. Other 4th-century military reports make no mention of Arabs but refer to as 'Saracens' groups ranging as far east as Mesopotamia that were involved in battles on both the Sasanian and Roman sides. The Saracens were named in the Roman administrative document Notitia Dignitatum—dating from the time of Theodosius I in the 4th century—as comprising distinctive units in the Roman army. They were distinguished in the document from Arabs. Beginning no later than the early fifth century, Christian writers began to equate Saracens with Arabs. Saracens were associated with Ishmaelites (descendants of Abraham's older son Ishmael) in some strands of Jewish, Christian, and Islamic genealogical thinking. The writings of Jerome (d. 420) are the earliest known version of the claim that Ishmaelites chose to be called Saracens in order to identify with Abraham's "free" wife Sarah, rather than as Hagarenes, which would have highlighted their association with Abraham's "slave woman" Hagar. This claim was popular during the Middle Ages, but derives more from Paul’s allegory in the New Testament letter to the Galatians than from historical data. The name "Saracen" was not indigenous among the populations so described but was applied to them by Greco-Roman historians based on Greek place names. The 15th-century Mishnah commentator, Rabbi Ovadiah of Bertinora, wrote that the word Saracen (Hebrew: סראקין) among Arabs had the connotation of "thieves" (Arabic: سارقيِن‎). The term "Saracen" remained in widespread use in the West as a term for "Muslim" until the 18th century when the Age of Discovery led to it becoming gradually obsolete. Wikisource has the text of the 1911 Encyclopædia Britannica article Saracens. ^ a b c Daniel 1979, p. 53. ^ a b c d e f g h Retsö 2003, p. 505. ^ a b c d e f g h Retsö 2003, p. 506. ^ The Editors of Encyclopaedia Britannica (2012). "Saracen". Britannica Concise Encyclopedia. Cambridge University Press. Archived from the original on 2018. Retrieved 27 April 2012. ^ Déroche, Vincent; Dagron, Gilbert (1991). Doctrina Jacobi nuper Baptizati, "Juifs et chrétiens dans l'Orient du VIIe siècle" (Edition of the Greek text with French translation ed.). pp. 17–248. ^ Kirby, Peter. "External references to Islam". External References to Islam. ^ Kahf 1999, p. 181. ^ Retsö 2003, p. 96. ^ Tolan, John V. (6 July 2002). 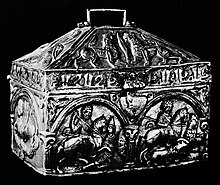 Saracens: Islam in the Medieval European Imagination. Columbia University Press. p. 15. ISBN 978-0-231-50646-5. ^ Shahîd, Irfan (1984). Rome and the Arabs: A Prolegomenon to the Study of Byzantium and the Arabs. Dumbarton Oaks. p. 125. ISBN 0884021157. ^ Toral-Niehoff, Isabel. "Saraca". In Cancik, Hubert; Schneider, Helmuth; Salazar, Christine F.; Orton, David E. Brill's New Pauly: Encyclopaedia of the Ancient World. 14. Brill Publishers. p. 1158. doi:10.1163/1574-9347_bnp_e1101160. ^ "الحوادث اليومية من تاريخ أحد عشر وألف ومية"" [The Chronicles of Ash-Sham"]. Yawmiat Shamiyya (Chronicles of Ash-Sham) (in Arabic). The Daily Events As of 1111 Hijri / 1699 CE. 15 October 2015. Retrieved 30 April 2018. ^ Retsö 2003, p. 457. ^ a b c Retsö 2003, p. 464. ^ a b c Retsö 2003, p. 465. ^ a b c Retsö 2003, p. 466. ^ Retsö 2003, p. 517. ^ Rubenstein, Jay (1 November 2011). Armies of Heaven: The First Crusade and the Quest for Apocalypse. Basic Books. p. 121. ISBN 0-465-01929-3. ^ Daniel 1979, p. 246. ^ Damascene, John (28 April 2012). "The Fount of Knowledge" (PDF). Gotiska Ärkestiftet av de Sanna ortodoxt kristna. Translated by Warwick, G. N. Archived from the original (PDF) on 26 September 2013. Retrieved 30 April 2018. ^ Heng 2012, p. 334. ^ Heng 2012, p. 231. ^ Heng 2012, p. 422. ^ "The King of Tars". The Crusades Project. University of Rochester. 28 April 2012. Archived from the original on 16 July 2015. Retrieved 30 April 2018. ^ Kahf 1999, p. 31. Kirby, Peter. "External references to Islam". External References to Islam. Daniel, Norman (1979). The Arabs and Mediaeval Europe. Longman. p. 385. ISBN 0-582-78088-8. JSTOR 43628523. Heng, Geraldine (19 June 2012). Empire of Magic: Medieval Romance and the Politics of Cultural Fantasy. Columbia University Press. p. 536. ISBN 978-0-231-12527-7. JSTOR 10.7312/heng12526. Kahf, Mohja (1999). Western Representations of the Muslim Women: From Termagant to Odalisque. University of Texas Press. p. 207. ISBN 978-0-292-74337-3. Retsö, Jan (4 July 2003). The Arabs in Antiquity: Their History from the Assyrians to the Umayyads. Routledge. p. 704. ISBN 978-0-7007-1679-1. Tolan, John; Veinstein, Gilles and Henry Laurens. 2013. Europe and the Islamic World: A History. Princeton University Press. ISBN 978-0-691-14705-5.